California billionaire and political activist Tom Steyer on Thursday endorsed current Tallahassee Mayor Andrew Gillum (D) in the Florida governor's race, committing $1 million toward Gillum's effort. Gillum has played the role of anti-establishment underdog, claiming he was the "true progressive" in the Florida governor's race. The primary takes place August 28. Steyer's profile has skyrocketed in the last year thanks to his "Need To Impeach" campaign, which has run television ads nationwide. He and his wife are also now the largest individual donors to Democrats in the nation. The Californian announced in January he would spend $350 million toward a Democratic takeover of the U.S. House. 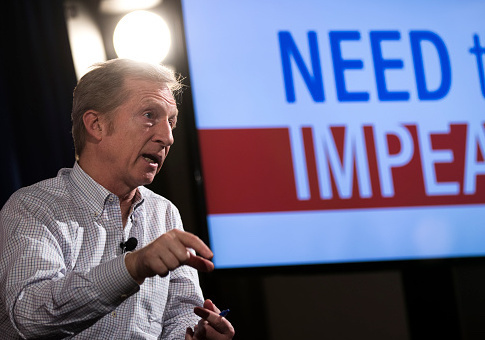 Despite the promise of lavish funding, House Minority Leader Nancy Pelosi has been critical of the "impeach" campaign, while former Obama adviser David Axlerod called Steyer's campaign a "more of a vanity project than a call to action." While Gillum's personal fundraising has been pedestrian compared to his competitors, George Soros has helped keep his message afloat. According to the most recent figures available from the Florida secretary of state's office, Soros has donated $450,000 to a PAC called Forward Florida, designed to promote Gillum. With another $50,000 from Soros's son Alex, the family as a whole has given a half-million dollars to the campaign. Steyer, meanwhile, is expected also to contribute $500,000 to Forward Florida as part of his endorsement, according to the Daily Beast, which first broke the news. And because Steyer already has some "get out the vote" efforts underway in the state from his NextGen PAC, he expects to be able to contribute another $500,000 "spent on boosting Gillum vis-a-vis a variety of existing NextGen functions, including on-the-ground organizing, field programs and digital and mail campaigns to turn out voters under 40," the Beast reported. Gillum was the beneficiary of a Hollywood fundraiser in March, with names like Alyssa Milano and Alec Baldwin contributing to the cachet. The Gillum campaign did not return a request for comment on the Steyer contributions. "As we battle for the heart and soul of this nation, Andrew Gillum is the kind of leader we need on the front lines," said Steyer in a press release. "He's someone we can trust to do the right thing, to put the people before the powerful, and who is unafraid to stand up for justice, now when we need it most. Those who are willing to act courageously and stand up for what is right, are those who will shape the political landscape of the country, and that's why we're taking this unprecedented step to make sure Andrew is representing the Democratic Party in November." Meanwhile, in Arizona, Steyer hosted a fundraiser for David Garcia, the candidate leading the Democratic field in a recent poll in the Arizona governor's primary that also concludes on August 28. The Arizona Republic first reported fundraiser. Steyer has already been active in Arizona this year, bankrolling a petition effort hoping to get a question on the ballot asking voters to increase the state’s renewable energy portfolio from 12 percent in 2020 to 50 percent by 2030. That campaign has been marred by accusations from an opposition group that the signature-gathering has been performed by dozens of felons, which could possibly run afoul of Arizona's ballot initiative laws. Although even some Democrats in the state have accused Steyer of forcing a California plan on Arizona voters, Garcia is endorsing the renewable energy proposal and is welcoming the out-of-state fundraising help as well in what he hopes will be a race against incumbent Republican Governor Doug Ducey. "Arizona is becoming increasingly important on the national stage and national leaders have taken an interest in David and our campaign because they know he's the candidate that can beat Doug Ducey—who only 26 percent of Arizonans say should be re-elected," said Sarah Elliott, Communications Director, for the Garcia campaign. "I think we've seen what Tom Steyer has had to say," Ducey was quoted in the Republic. "We've seen the commercials he's running. We’ve seen the initiatives he's been behind. You guys can do the rest." NextGen did not return a request for comment. This entry was posted in Politics and tagged Florida, Tom Steyer. Bookmark the permalink.